MTH Premier Santa Fe 2900 class or 5011 class, 054 curves? I have some 054 curves on my layout so it sounds like it would work on that part of my layout. Has anyone run one of these locomotives on 054 curves? Did it run ok? How much overhang does it have on 054? I have a MTH Premier Southern Pacific GS4 Northern and it works on 054 fine but the 2900 class is a larger locomotive. I have one and I have run it on 054. Does have some overhang. Thanks. Do you have any idea how much front/rear overhang it has? If you could measure it and let me know I'd appreciate it. I'm just concerned with the overhang around the 054 curves. My Premier GS4 Northern goes around 054 fine but has some overhang, the most at the rear. In some spots there is only about 1/8" max clearance between the back of the cab and rolling stock on an adjacent 072 curve. I'm curious if the 2900 class Northern has the same or more overhang. If it has more I'll probably rethink purchasing one. I could run it on my 072 loop but I prefer to purchase locomotives that won't be restricted to only certain sections of my layout. Below are pictures of the overhang my Premier GS4 Northern has on 054 curves. If anyone could measure how much overhang a MTH Premier 2900 class has on 054 curves I would appreciate it. 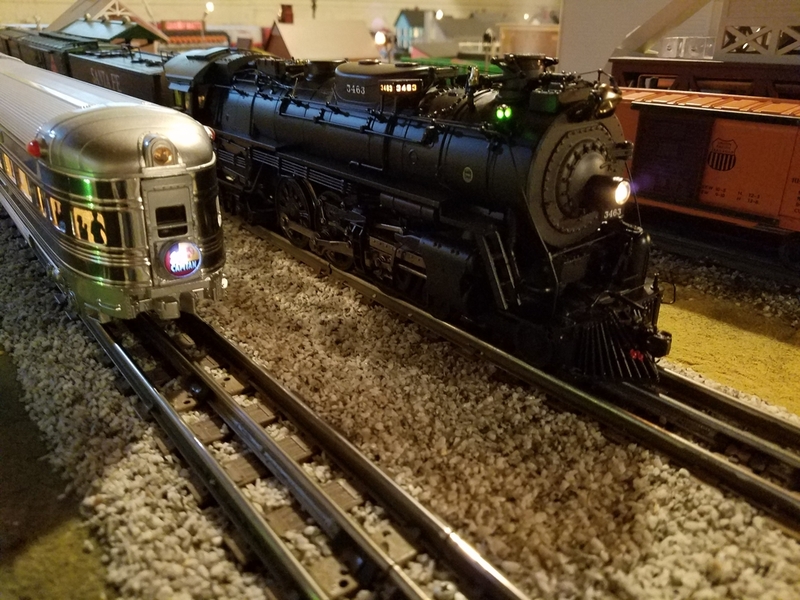 If it's excessive I may end up going with another MTH Santa Fe 3460 class Hudson (I already have 3463), either unstreamlined or the 3460 Blue Goose. Those work great on 054 and have plenty of clearance all around. But they should, as they are smaller locomotives. 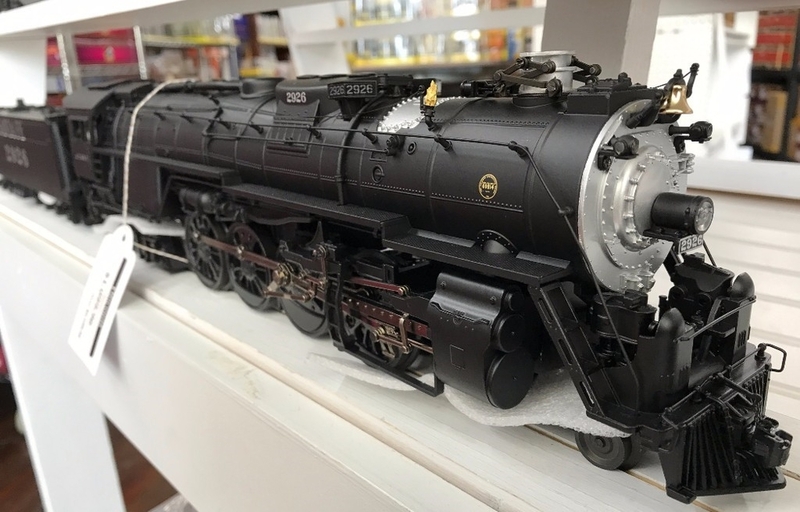 I have an older MTH Premier Santa Fe 4-8-4 Northern #2921 and will put it on my Atlas O-54 on Monday and get you some measurements - distance from center-line of center rail. Thank you. If you could measure from the outside rail to the end of the pilot and cab overhang that would be the most helpful to me (like in the pictures of my GS4 I posted above). Whenever you get a chance is fine. I'm not in a rush. OK. Will check tender too. Thanks. Usually the tender overhang is fine, at least no worse than a 50' freight car. I'm more concerned about the rear cab overhang than anything else. That part of a steam locomotive usually has the widest swing. I'm not concerned about a Premier 2900 class looking silly on 054 curves, I'm concerned about the overhang hitting rolling stock on the adjacent track. A Rail King 2900 class is not in the picture. It would be dwarfed by my Premier Santa Fe 3460 class Hudson and Premier Southern Pacific GS4 Northern, not to mention the other scale size diesels I own. I'll take some pictures on Monday of my MTH Premier Santa Fe 4-8-4 including the overhangs. It is one of the first engines I purchased (21 years ago) and I still consider it to be one of the nicest. The overhang is one issue. The other is how silly the center two wheels look hanging in mid air as they shortcut across the inside of the curve. On top of that the front and rear axles have to grind through the turn and the swing between the cab and tender cause extra stress on the tether. There have been pictures posted of paint worn off of wheel counterweights because the drive rods were rubbing them. Some folks have to have that big steamer and it can grind around a tight radius without derailing so they're happy. Just because you can, doesn't mean you should. IMO a berkshire is pushing it on o-54. The original Proto-1 versions like 20-3013-1 suffered from tragically tall, toy-train gearing. IMO the Proto-1 version isn't a good runner. Speed control is a must, and it will be working full time to prevent this long-wheelbase, rubber-tired loco from slowing unrealistically as it enters the O54 curves. At some point after the original 1995 issue, I'm pretty sure that MTH redesigned the chassis, with a larger worm wheel as used on the UP FEF and NYC Niagara. These mechanical improvements make it worth holding out for one of the newer PS2 or PS3 versions. Problem is, they never advertised or publicized these improvements. So unless you want to download and swap a bunch of sound files, it might be tough to pinpoint which was the first version to have the improved gearing. The 2900 is a huge loco. I would strongly consider a scale 3751 instead, if you don't already have one. For either of these, the 3rd Rail version would be my first choice, and Lionel did a pretty good job with their 3751 too. MTH rated the locomotive at 054, so I suspect it should take those curves fine without damaging itself in the process. 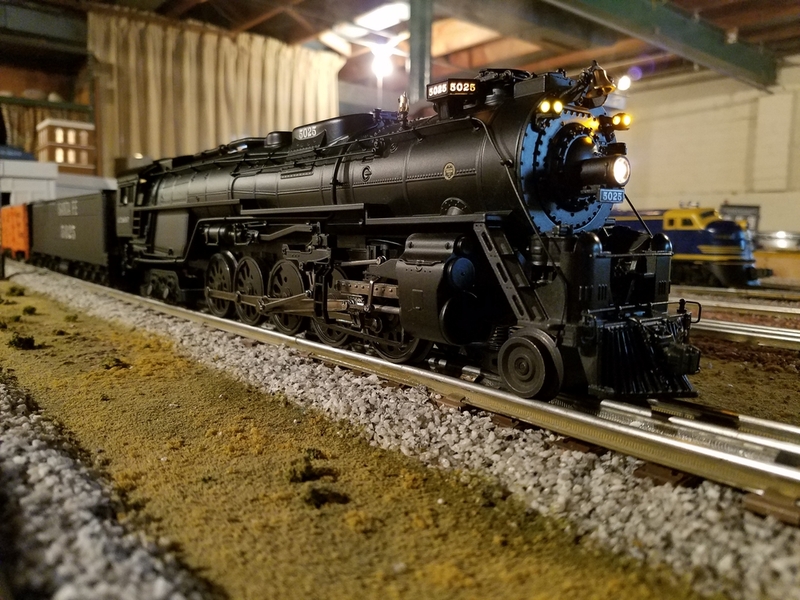 These photographs show my MTH Premier ATSF 4-8-4 #2921 steam locomotive on Atlas O-54 curved track. This is an older model with PS1 but it is impressive nonetheless. I used a plastic triangle set against the side of the engine and a steel rule to measure the overhangs. The cab overhang is 1-13/16 inches measured from the (outer edge of the) outside rail as shown in the photos. The corresponding overhang at the pilot truck is 1-3/8 inches. The second and third drivers are just about off the inner edge of the outer rail on the O-54 curve and the cab overhang looks very large. It appears that the front and rear trucks have adequate range of motion to operate on Atlas O-54 but I think the rolling resistance would be very high. I would not operate this model on Atlas O-54 curved track. Thanks for the measurements and pictures. I'll check and see how that overhand would work on my layout. It appears to have a similar amount of overhang to my Premier GS4 Northern on 054. Because of that I usually restrict my GS4 to my 072 loop. Being that I would want to run this locomotive on both my 054 and 072 main lines I may have to go with something smaller than the 2900 class. I have a feeling that the rear of the cab would be very close to hitting rolling stock on the adjoining track. 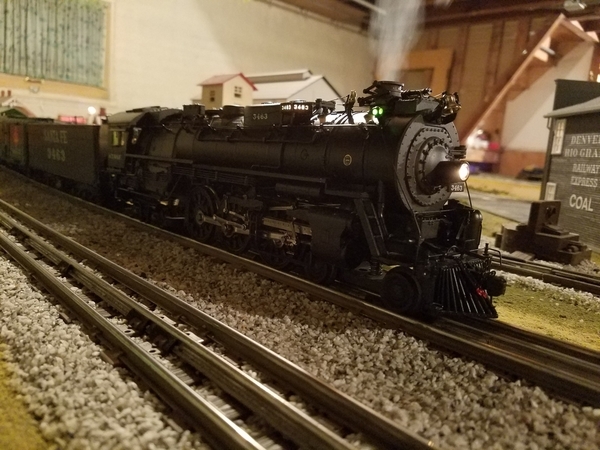 I have been running this engines cousin, the 2-10-4 on 054 with no issues. The 2-10-4 and the 2900 Class 4-8-4 appear to share the same boiler casting. I believe that the first and fourth axles on the 2-10-4 are flanged (it's been a while since I looked)-that might give the 2-10-4 a slightly shorter wheel base in the curves. By the way, the MTH U.P. 4-12-2 will also operate comfortably on 054. Quite frankly I'm surprised that the 2-10-4 will go around an 054 curve. On the MTH model only the 1st and 5th set of drivers are flanged. I would assume that the overhang from the 2-10-4 on 054 has to be worse than the 2900 class. I'm curious if the 2-10-4 has more or less overhang than the 2900 class 4-8-4 on 054. If you get a chance could you measure the overhang, just for fun? I measured my MTH Premier 4-8-4 Northern and 2-10-4 Texas type. The rigid wheelbase of the 4-8-4 model is about 5-1/4 inches (21-feet full scale). The rigid wheelbase of the 2-10-4 model about 6-1/2 inches (26 feet full scale). The length behind the rear driver on the 4-8-4 model is about 6 inches (24 feet full scale). The length behind the rear driver on the 2-10-4 model is about 5-3/4 inches (23 feet full scale). Since the rigid wheelbase of the 2-10-4 is longer and the length behind the rear driver is smaller than the 4-8-4, the rear cab overhang toward the outside of a curve is smaller on the 2-10-4. I did not measure on the layout. Thank you sir! I learned something there! That's just nuts. I never thought about it that way but it makes sense. If the 2-10-4 could go around a 054 curve then it would have less overhang. 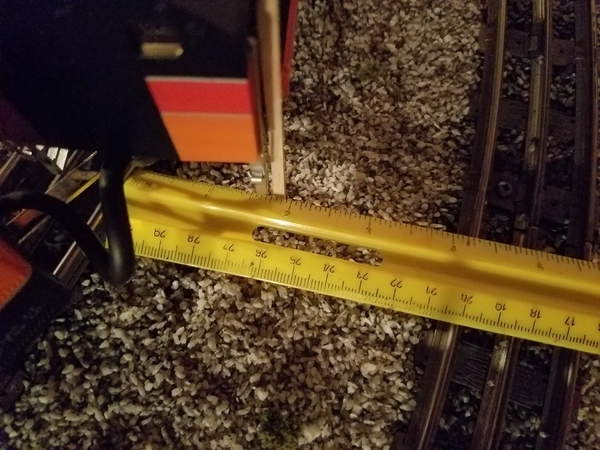 I measured the overhang numbers you provided on my layout. Because the 2900 is slightly longer than a GS4 it overhangs about 1/16" more. 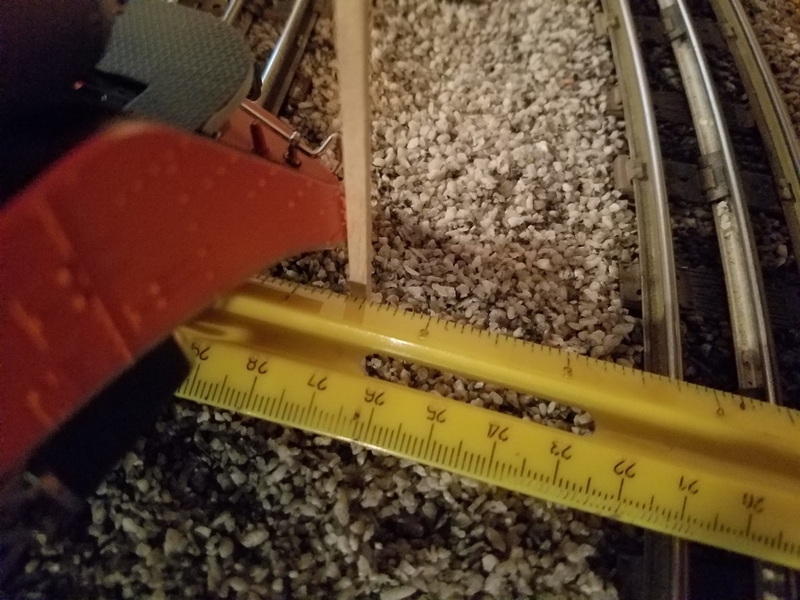 So instead of having a 1/8" gap between rolling stock on the adjacent track like the GS4 does it would only have 1/16" of a gap or slightly less. Waaay to close for comfort. Someone want to measure the overhang of a Premier Santa Fe 2-10-4? In all honesty I'm probably better off with another 3460 class Hudson. If you want to run a Santa Fe steamer, I think the Hudson is the best choice on O-54. 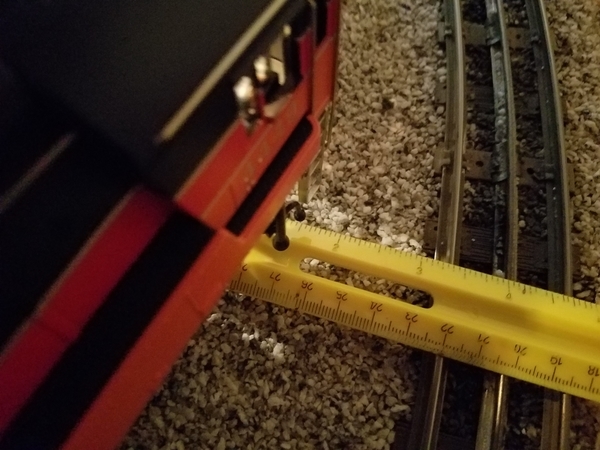 Making measurements on the layout, taking pictures and writing the post kept me busy today... Thanks. Thanks for taking the measurements. At least I know that if I ever purchased a 2900 class it wouldn't work on the 054 sections of my layout. I already have one Premier Santa Fe 3460 class Hudson, 3463. It runs great on 054 with not much overhang. So I could get one of the other non-streamlined road numbers (3461, 3462, 3464, 3465) or 3460, the Blue Goose. At least that way I'll know the locomotive will clear everything on my layout fine. Excellent thread guys, great work conveying the overhang. So running a MTH Premier Santa Fe 2-10-4 on 054 like the above poster might not be such a feat after all. 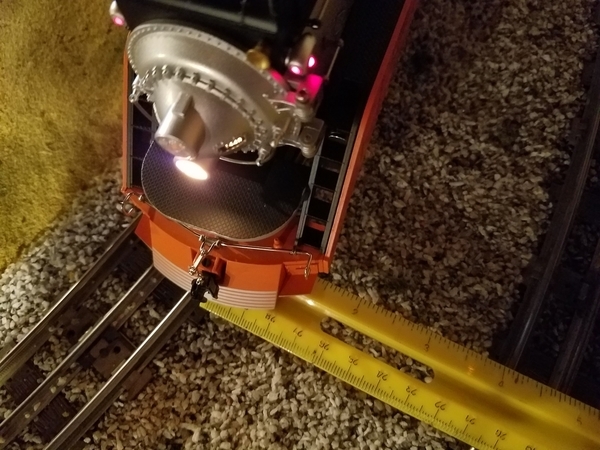 I will make the same set of measurements on my MTH Premier ATSF 2-10-4 Texas type and report back. Thanks. You've been very helpful. This whole thread got far more technical than I thought. I should take measurements with my Premier SP GS4 Northern for comparison purposes. I can do that one too. Sometime next week. I'll take some measurements from my Premier GS4 Northern Saturday as a comparison. I have Lionel tubular 054 curves, which may be slightly different than Atlas curves. These photographs show my MTH Premier ATSF 2-10-4 Texas-type #5012 steam locomotive on Atlas O-54 curved track. I used a plastic triangle set against the side of the engine and a steel rule to measure the overhangs. The 2-10-4 Texas-type cab overhang is 1-23/32 inches measured from the (outer edge of the) outside rail compared to 1-13/16 inches for the 4-8-4 Northern. Thus, the cab overhang of the 2-10-4 is 3/32 inches less than on the 4-8-4. On the 2-10-4, the third driver is completely off the inner edge of the outer rail on the O-54 curve. This is consistent with the longer rigid wheelbase of the 2-10-4 compared to the 4-8-4. It appears that the front and rear trucks have adequate range of motion for both models to operate on Atlas O-54 curved track. Thus, based on cab and pilot overhang, it appears that the 2-10-4 has better turning performance than the 4-8-4 on Atlas O-54 curved track. Thank you for the measurements. I'm quite surprised that the 2-10-4 actually has less overhang than the 4-8-4. Although the 2-10-4 has the wheels hanging off the inside of the curve on 054 it actually works. I'm quite surprised by that, and it gives me more options as far as equipment goes. I measured my MTH Premier Southern Pacific GS4 Northern this morning on the Lionel 054 curves on my layout. I measured from the top of the rail head like you did. It has virtually identical measurements to the Santa Fe 2900 class Northern you have. Front overhang is 1-7/16", rear overhang is 1-13/16". 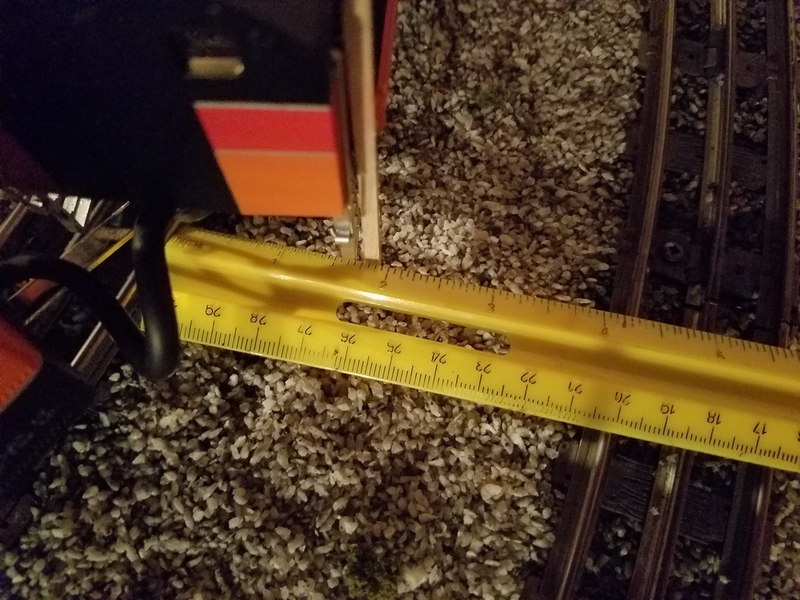 When going around the 054 curve closest to a 072 curve on my layout there is 1/4" clearance between the rear cab of the GS4 and a 16" aluminum passenger car parked on the adjacent 072 curve. In that case the 2-10-4 would actually have more clearance than the Northern. But either a 2900 class Northern or a 2-10-4 should work anywhere on my layout, which is good to know. @Lou1985 For future reference... how far apart are the center lines of the two curves? Although everyone's equipment may vary, this is a good thing to know for layout planning purposes. Thanks! I don't know how much that information would help anyone else but me. The 054 loop inside of my 072 loop isn't even all the way around. For lack of a better term it juts out in two spots to clear the end of a yard, so it's not even all the way around, unlike the outer 072 loop. 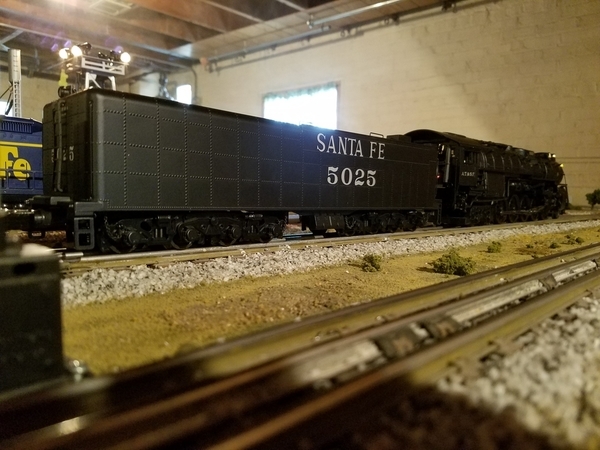 Well as an update I ended up buying a MTH Premier Santa Fe 2-10-4 Texas. I got a great deal on a MIB PS2 3V version. I would have passed on it if I hadn't started this thread. It works great on both 072 and 054 tubular track. The inner drivers are off the curve on 054 but those areas are hidden on my layout, so it doesn't bother me. To the extent that I might have helped in your decision to purchase, I hope you enjoy the new model. I think MTH did an outstanding job on these. You share much of the blame for this purchase 😉. It's a very nice model and runs/smokes/sounds great. I do plan on painting the smokebox front gray at some point, as that seems to be an oversight on MTH's part.